It's been 1.5yrs since Tetraites' submission. Just checkin' if there's been any movement with the other judges on him? I liked watching you run him in one of your recent videos. Hopefully we get word on him soon! Hmm. I'm not sure that's the case, but I don't know. The message wasn't targeted at me. Still, if I know something is moving slowly at work, I can certainly sympathize with an occasional polite bump from the person who is the most invested in the finished product. Oh no, it's a fair question. Ask after a month or two, you're pushy. More than a year? That's bad on our part. I have a goal of getting submissions through the system in a year, but that's entirely dependent on the assigned Judges' schedules. The answer is, without any specifics, yes, there are reviews in the works. Does this merciless gladiator have what it takes to join the ranks of his rebellious brethren or will he face get a "thumbs down" in the arena? As a gladiator hero Tetriates lends himself to comparison to the others of his kind. While Retarius can continue to be forgotten, Crixus seems can seem the more attractive option at 20 points cheaper, equal stats, and powerful defense. However, Tetraites' ability to kill 2 squad figures a turn coupled with the fact that One Shield Defense is more useful against higher attacks means that he has an edge against mass squads. It is debatable if that conditional advantage is worth 20 points but Crixus has long been a competitively costed hero. The theme for Tetriates is just great. Some gladiators reveled in their station and this hero fills that role perfectly. Finishing Blow is nicely thematic, if a bit marginal. I like the added theme of its use against Crixus and potentially bypassing his One Shield Defense to finish him off. Spiked Gauntlet is perhaps a too literal application of every detail on a mini but it fits nicely into his merciless theme as you imagine him using the weapon against helpless squad figures. I'm all for seeing evil versions of existing groups for Utgar and he fits the bill nicely. Both new powers are intuitive and thematic. Finishing Blow may be a bit marginal but the theme is strong enough for it to be worth it. Without the support of the Capuan Gladiators Tetraites has limited use. Finishing Blow can be written off almost entirely which leaves his stats and Spiked Gauntlet as the only draws. While the latter helps him take down squads with up to 2 kills a turn, his defense is simply too low for him to last that long. His high attack helps him punch through tough enemies but Crixus does the job of anti-hero better at 20 points cheaper. He is a little versatile in that he can kind of do both but there are just more attractive options around his price point if you're looking for a solid hero. That leaves him as a bonding hero for the gladiators. Again, his role continues to run against Crixus and doesn't always come out favorably. However, short of a little luck with skewering with a Gladiatrix, Tetriates is your only option to take down up to two figures a turn with your hero. Even still it's not always possible for him to do it and it can be a trap to chase the kills too aggressively since it will only happen 35% of the time. Even the threat of using it can make a difference, however, so Tetraites can still get used in a Gladiator army if you were going to pick Crixus and realized that you still had 20 points lying around. The gladiators with Spartacus are a jealous lot so its not like random filler units do them that much good, after all. Tetriates stands in the shadow of his brother in the Colosseum, Crixus, but he can still make a name for himself in the arena with his useful and thematic powers. I vote YEA to induct Tetriates to the Soldiers of Valhalla. This is my last vote as judge for SoV. Life moves on and shifting priorities means that I no longer have the time to dedicate that this project deserves. It has been a privilege to work with this fine group and I hope that in years to come I'll be able to visit Heroscapers and see all the fantastic work going on here. Thanks for your time and service in the SoV! I've been excited by this figure I found recently and I've landed on a design that I think is unique, fun to play, and thematic. 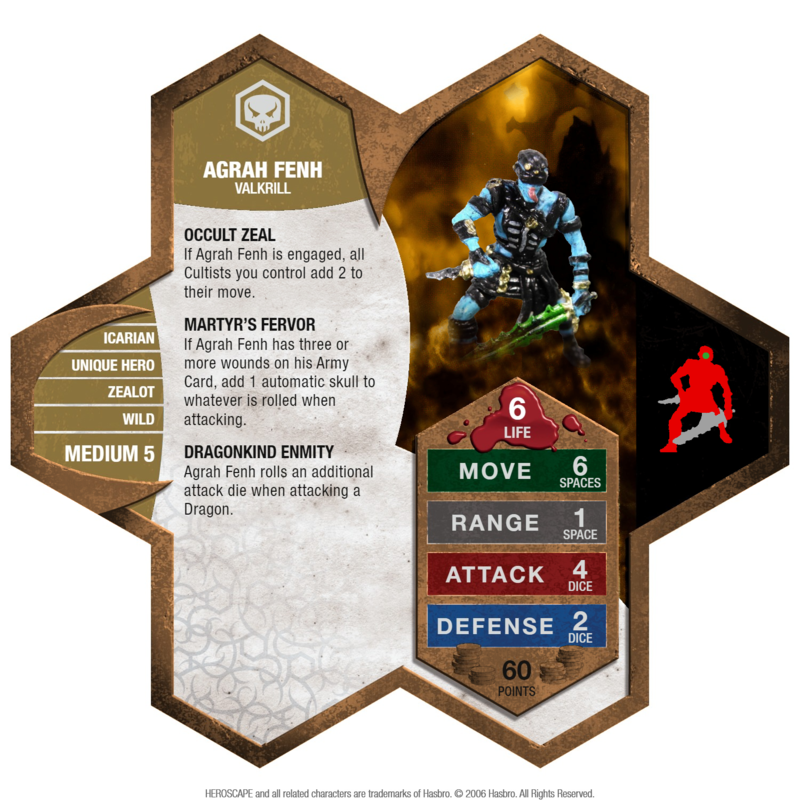 I'd like to submit Agrah Fenh for SoV consideration. The figure used for this unit is a Pathfinder Battles figure from Jungle of Despair, which I believe was released earlier this year. It's #17 - Urdefhan Warrior. There's 8 at CoolStuffInc, 3 at Noble Knight Games, 24 at Troll and Toad, 20+ at MiniatureMarket, as well as 99+ at Paizo and various smaller quantities on eBay. It's $1.99 at Troll and Toad, and $2.00 at MiniatureMarket. Agrah fills an interesting role as a shark/cheerleader. His cheerleading power only comes into effect when he's at his most vulnerable, and (once he's engaged) he's not usually worth an Order Marker until he can get his auto-skull. At that point, he has 3 or fewer life and only 2 defense. At 60 points, he offers a cheaper alternative to a squad of Nhah Scirh Cultists (especially in limited-figure formats), while still helping them maintain board control with his move boost. With height and a few wounds on him, he can throw 6 attack dice + an auto-skull at an opponent's dragon, which has serious game-changing potential. There aren't many existing 60-point melee heroes to compare him against. Shiori has a ranged special, Kantono activation synergies, and is still pretty bad. Darrak has similar stats (4 attack situationally boosted, 2 defense), but he has arguably more survivability from Hide in Darkness and definitely benefits from Axegrinder bonding. I've included a draft of his bio below. Agrah Fenh knew his day was coming. Tomorrow, the Nhah Scirh would go on the hunt. Tomorrow, he would lead them. For those who were not born under the teaching of Nhah, there was only one way to join the cult: a trial by fire. He dressed himself in leather straps, and hefted the Sword of Ilves. He would earn his armor tomorrow. Either that, or die a martyr. Special thanks to Astroking112, Scytale, Kinseth, Leaf_It, and Sir Heroscape for their input! Last edited by superfrog; September 21st, 2018 at 12:36 PM. I feel the theme comes through very well and I love the crazed, risky play. Love the sharky cheerleader idea and I think you've hit a good balance with it. The only minor quibble I have at the moment is that I'd rather his movement boost help all cultists, not just Icarians, for some potential fun cross-cult future synergies, but that's mostly flavor and a small thing in the end.